PORTLAND, Maine — Exceptional dangers require exceptional and sometimes unusual responses. This was the spirit animating the volunteers at a phone bank Tuesday night in Portland. They were asking citizens to urge their state’s popular Republican senator, Susan Collins, to oppose the confirmation of Judge Brett Kavanaugh to the Supreme Court. And if they found a sympathizer, they took an additional and, for some, a controversial step: Asking for a commitment to contribute to a fund that would be activated against Collins’ re-election, whose term is up in 2020, if she voted for Kavanaugh. It is one of a host of ways in which Kavanaugh would likely push the Supreme Court well to the right of where it is since he would replace Justice Anthony Kennedy, a more moderate conservative. That is a central reason why his nomination has generated such passionate resistance. Nan Aron, the president of the Alliance for Justice and a liberal veteran of confirmation battles, echoed the view of many on her side. “The level of engagement is the greatest I have seen since the Bork nomination,” she said, referring to the successful derailing of Robert Bork’s 1987 appointment to the court. For the activists here and many around the country, the fears around Kavanaugh’s nomination begin with abortion rights. But the catalogue is much more extensive, reflecting the broad array of concerns of the activists mobilizing against him. Ben Gaines worried that Kavanaugh would look for ways to side with President Trump in a dispute over special counsel Robert Mueller’s investigation. Dini Merz has the same apprehension, and also mentioned Kavanaugh’s views on “corporate power” and “religion and its role” in American life. Follayttar Smith spoke of the likelihood Kavanaugh would roll back environmental regulations and the Affordable Care Act. Susie Crimmins saw him as “dismantling government in its role of protecting the marginalized.” Louise Lora Somlyo felt that Kavanaugh had not been candid in his testimony before the Senate. More broadly, there is a belief that the would-be justice is primarily a partisan and an ideologue. “He’s a political animal to the core — and I say that as a political animal,” said Gaines, who worked for many Democrats around the country. Collins is an unusual Republican who has, by turns, gratified and infuriated liberals in her state. Alicia Barnes, a Navy veteran, said Collins “had our backs” during the campaign by LGBTQ groups to end the military’s “Don’t Ask, Don’t Tell” policy; Follayttar Smith spoke of the appreciation across the state for Collins’ vote to defend the Affordable Care Act. But Collins’ later vote for the Republican tax cut was a reminder of how often she has been loyal to her party’s leadership, and Bill Nemitz, a veteran columnist for the Portland Press-Herald, wrote a passionate column last weekend suggesting a vote for Kavanaugh would be a breaking point. 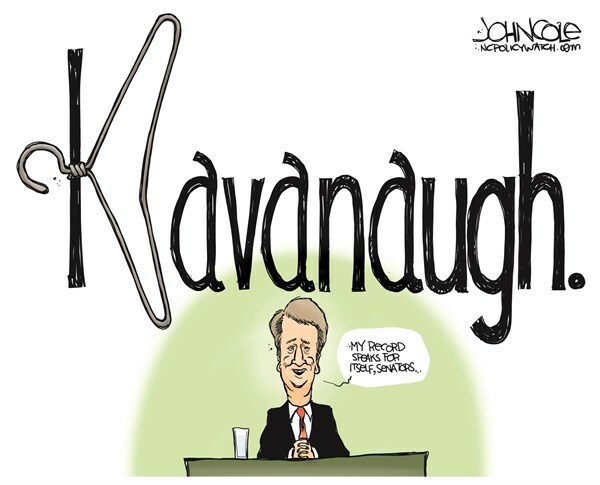 But there is a larger issue of hypocrisy that incites aversion to Kavanaugh. Repeatedly, Republican presidential candidates promise (usually indirectly, but, in Trump’s case, directly) that they will nominate justices who would challenge Roe v. Wade and, more generally, toe a conservative line. Once they are nominated however, these would-be justices pretend not to hold the views they hold. And when skeptics point out their obvious evasions, defenders denounce these objections as purely partisan. The affable Collins is now confronting the backlash to this long history of double-speak.